This is the time of year when people all around the country are going “mad” for basketball. As a sport, basketball requires players to be agile, fast, strong, powerful and have incredible endurance. To compete as a collegiate or pro athlete takes a serious commitment to staying in top shape year-round. 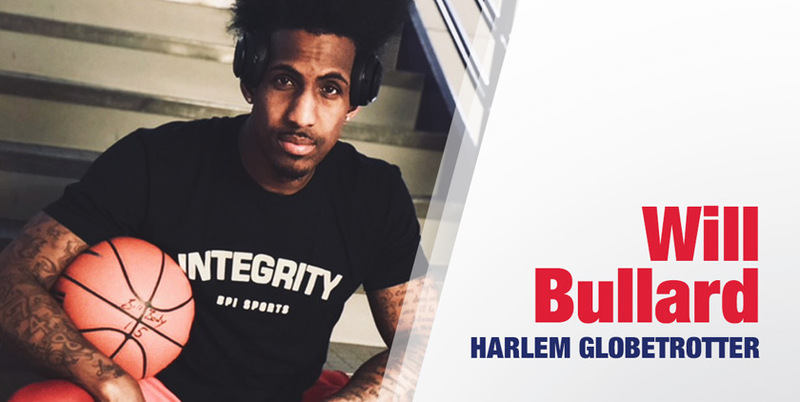 Harlem Globetrotter, Bull Bullard, knows a few things about staying fit, particularly for basketball. As a professional athlete, he travels the world playing the game he loves. Being a Harlem Globetrotter requires not only world-class skill, but otherworldly athleticism and endurance. In order to maintain his extremely high level of fitness, Bull relies on the following strength and conditioning routine. For your cool down, shoot baskets from different spots on the court, focusing on maintaining proper shooting form and go through basketball drills with cones for dribbling. It’s all about muscle memory! Consistency helps you maintain while you gain! Bull Bullard has a larger-than-life personality, which goes well with his otherworldly basketball skills. He is continually pushing himself to create incredible trick shots and improve his game, even on a demanding schedule, which sometimes calls for two games in one night. This drive extends beyond the basketball courts as well. Bull uses his position as a Harlem Globetrotter to inspire kids to stay fit. His #bullbodyproject is a worldwide campaign that motivates children to be healthy and stay active.